ASP.NET Forums/Data Access/SQL Server, SQL Server Express, and SQL Compact Edition/How do I get just the date in sql from a datetime? How do I get just the date in sql from a datetime? I can get the year by doing the following to a datetime year(@date). How can I get just the date from a datetime in sql? Re: How do I get just the date in sql from a datetime? Refer below link to get part of date. to show only date part, like 31-12-2016. 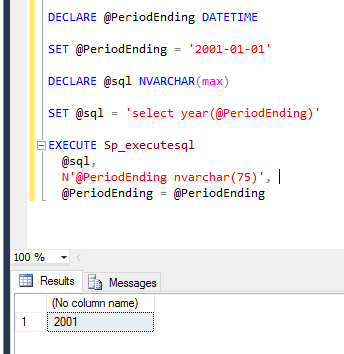 If I have a variable @PeriodEnding that I passed to a stored procedure, and the value is a datetime, I want to extract only the date part in the stored procedure. Good, it's always best to know what you are trying to do. For this my personal preference would be to select rows >=january 1st and <january first of the next year. The point is that an index on the ExpeDate could be still then used while using the year function will prevent using the index. Else for the particular error you have I would use sp_executesql parameters (it's only @TableName for which you have to build a string, you can still use parameters for the other values and then you don't have to deal with converting back and forth to and from actual types to a string which is likely your issue. Thanks again for the reply. I like your idea. Can you give me the exact SQL Code to use for that? Chris, thank you so much. That was really helpful. One more related question. Must declare the scalar variable "@AssetID". Is this your actual code ? I don"t see @AssetID anywhere in the code you are showing. I would keep @PeriodEnding as a datetime (rather than as nvarchar(75)). Edit: you don't pass @AssetID as a table name parameter ???!!! Yes, sorry about that. ID is "AssetID". I still get the same error using the above recommendation. Unclear. So your intent is that @ID is a column name ??? In your parameter list it is an INT so you shoudln't be able IMO to pass a string?? @ID is actually @AssetID, not the primary column, but a column in the table that is set as an integer type. So try my earlier response. My understanding is that you want to pass a column name as well and that you should add a parameter for the actual column value. You would generate then a SQL statement with a table name and column name and other values are still passed as parameters. MyHelper.GetReader("SELECT * FROM ActualTableName WHERE ActualColumnName=@ID",IdValue); and be done with that..